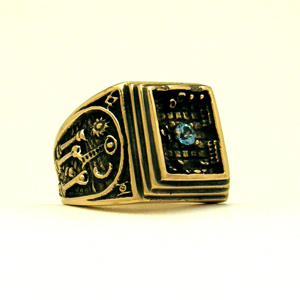 The Traveller's Ring, Bring the Craft with you. 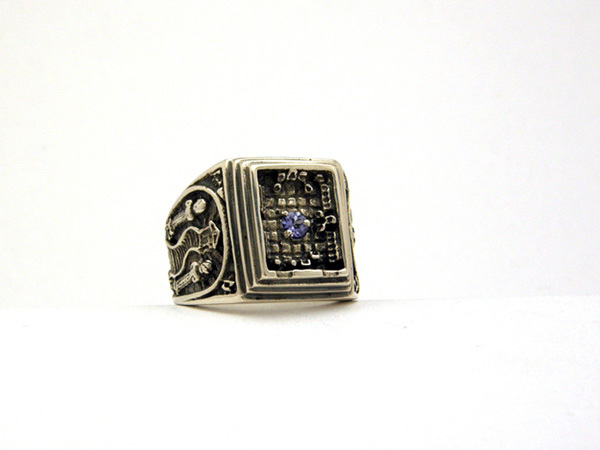 The Traveller’s Ring with an AA Tanzanite. 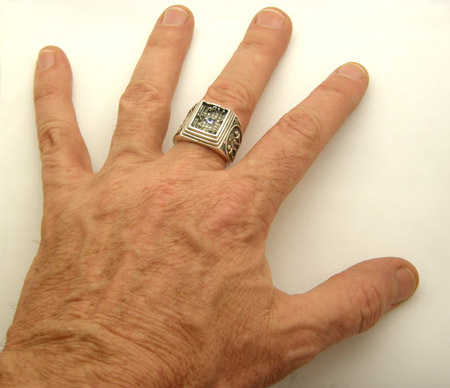 The Traveller’s Ring is a bold men’s ring in a rectangular shape, fashioned after the style of extended coverage on the finger and around the sides. It is designed to catch the eye at first with three strong horizontal surfaces, and then give the impression of "pave" style mini jewel settings inside the crest around the centerpiece. Upon further inspection, it is shown the crest is actually a scale model of a western style lodge room. The sides feature quite accurate first and second degree “Ancient Style” tracing boards carved on the sides, along with four specific ritual details as shown in the top corners. The crest starts with The Three Steps, upon which entry to the Lodge is through the small doorways to the main entrance and the preparation room. The Lodgeroom itself features the Two Pillars, Altarpiece, each of the officer’s positions (except Organist) and also the Three Lesser Lights. As a centerpiece is your choice of either the altar with a small set of the Three Great Lights, or the gemstone of your choice, to represent the Altar. In addition to the Crest being an accurate Lodge layout, the Tracing Boards on each side of the ring are detailed enough to include many queues that may be useful in the Lodge room during ritual or lecture. 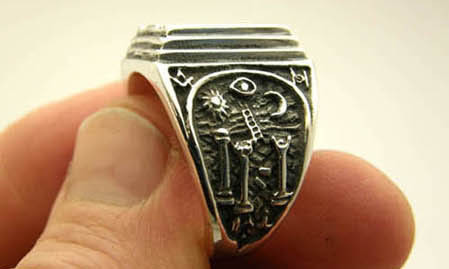 It could even be said a reasonablly proficient Master Mason may possibly give the first two degrees using only this relatively compact and rather fine looking ring. The 1st Degree side displays the Square and Compasses, the Rods of St. John; surrounding a point within a circle, the Three Columns showing the three principle orders of Architecture, Jacob’s Ladder, Rough and Perfect Ashlar, The Sun, The Moon, The Mosaic pavement, the Three Principle Working Tools, and, the All Seeing Eye of Providence. One of the handy features that might be helpful in the Lodgeroom is while the three columns are diagrammed as the three principle orders, also, if you look from the top of the ring, they show a "D", I, or C shape design respectively to aid in keeping them straight. The 2nd Degree includes the Winding Staircase, J&B Columns with a very small J or B on the bases, Corn/Grain growing/suspended near a Waterford/River. The Winding Staircase does indeed have 3, 5, and 7 steps, and at the top of the stairs a welcoming Brother awaits in the proper position. The pass grip of a FellowCraft Mason is subtly represented in the upper left, while the upper right shows the Fellowcraft Compasses. It is not always known that the Third degree was not originally part of Craft Masonry and was written and included later. 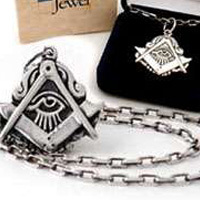 It is posited that this may be so more speculative Brothers may reach the level of “Master Mason” because the Third Degree, or something similar, was traditionally given only to those who served as Master of the Lodge. 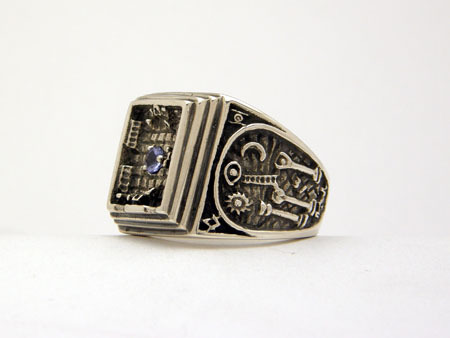 So, following the oldest traditions of the craft, this ring enables the wearer to bring the ritual with them. 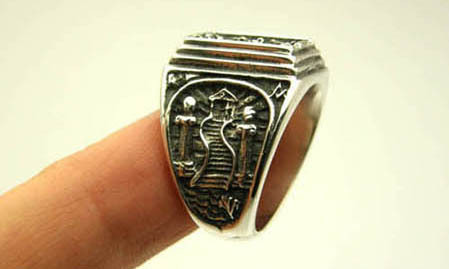 Being so detailed, this ring is considerably more difficult to make than our other items. It has required three years of work, over many months of design, months of carving, and two months of casting/molding. 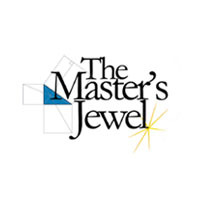 To create the waxes for each customer's ring requires further lowering the viscosity of the wax, treating the mold interior to reduce surface tension, and development and use of a proprietary vacuum bag / injection wax technique. 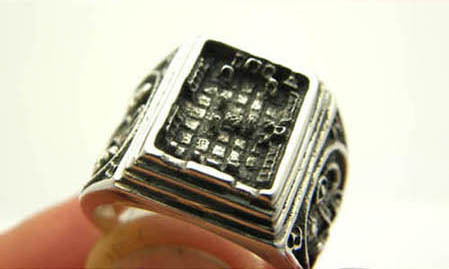 The weight of the ring is also above average, at approximately 24 grams in silver for a size 10.5, and over an ounce in 14k Gold. These are the limits of our jewelry manufacturing technology, and unfortunately this difficulty and weight is reflected a bit in the price, but we hope that the art craft and design of it all will remove any hesitation. Plus it could really come in handy some night at Lodge! Dedicated to the GAOTU and the Global Craft. 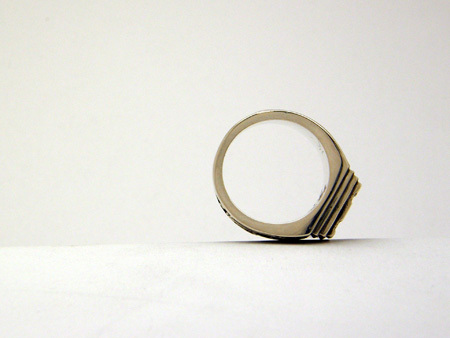 18mm total length of crest, 15mm wide, and rises 5mm off the finger. The interior of the Lodge Room is 13mm long by 10mm. Currently 71 guest(s) and 0 member(s) online.